OKLAHOMACITY (May 31, 2017) – In Oklahoma, nearly 62 percent of public school students are eligible for free and reduced-priced lunches. During the summer months when school is not in session, only 6.4 percent of those same students participate in summer feeding programs, ranking Oklahoma 51st in the nation. 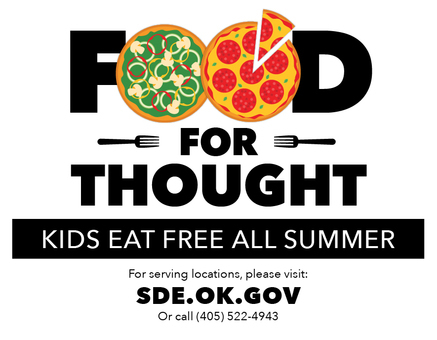 To that end, State Superintendent of Public Instruction Joy Hofmeister today announced the launch of #FoodforThought, a public awareness campaign by the Oklahoma State Department of Education (OSDE) and its Office of Child Nutrition to significantly increase the number of free meals served to Oklahoma kids 18 and under during the federally funded Summer Food Service Program. Hofmeister announced the initiative at the kickoff event for Tulsa Public Schools’ summer meals program at Disney Elementary in east Tulsa. Sixty-seven Tulsa Public Schools sites are serving summer meals this summer. The #FoodforThought campaign emerged from the collaboration between Hofmeister and her Faith-Based Advisory Council, one of several stakeholder groups with whom the superintendent meets regularly. The advisory council expressed an interest in partnering with OSDE on an initiative that would make a difference in their communities. Oklahoma has one of the highest rates of food insecurity in the nation. Food insecurity exists when a population has limited or uncertain access to safe, nutritional food or an inability to acquire it. An estimated 1 in 4 Oklahoma children – 220,000 in all – are considered food insecure, and research indicates that students who struggle with hunger have poorer academic and health outcomes than those who do not. The summer meals program offers convenience to families; the vast majority of Oklahoma’s more than 600 sites are open, and children simply arrive on site to eat and are not required to pre-register or present paperwork. Families interested in finding a serving site can text FOOD to 877877 and enter their zip code to receive a reply with information on the three closest serving sites to that location. The state’s 182 program sponsors are responsible for the myriad of details involved in overseeing the operations of hundreds of meal sites. Campaign materials include postcards, posters, and door hangers. Oklahoma City-based Tyler Media provided metro-area bus benches and produced radio PSAs in English and Spanish. Bookmarks courtesy of the Metropolitan Library System are also part of the initiative. The Tulsa-area United Way and United Way of Central Oklahoma partnered with OSDE on the distribution of materials. Summer Food Service calendars vary from site to site. Find a summer meals site or for serving dates at a specific site.